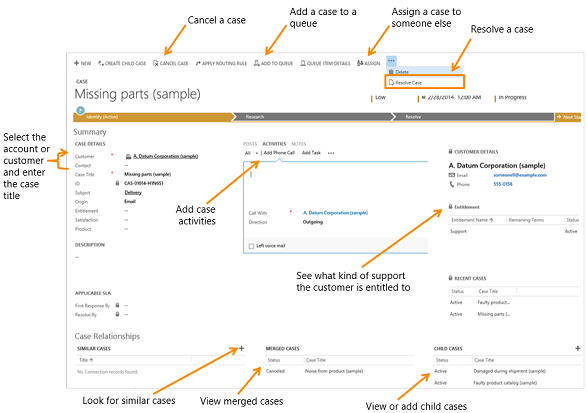 Keep track of your customer requests and issues by creating support cases in Microsoft Dynamics CRM. When a customer contacts support with a question or problem, you can quickly check if there is an existing case or open a new case and start tracking the issue. You can also escalate, reassign, or put a case back into the service queue if you don’t have enough information or time to work on it. Before you provide support, you can also check the customer’s entitlements. Entitlements are like contracts that tell you what kind of support a customer is eligible for. You can see if the support terms are based on number of hours or cases, support channel, or based on the product or service that the customer has purchased. To help you choose the right status of a case, your admin may have set things up so that you only see a limited set of statuses to choose from based on the current status of a case. For more information on the available list of case statuses, contact your administrator. a. Choose the Customer lookup button. By default, this field shows both account and contact records. Or, type a few letters and press Enter to search for records that contain the letters. When you select an existing customer, the customer details will show the contact details, along with recent cases and activities for the customer. b. If a customer record doesn’t exist, choose New in the inline lookup results to create a new record. Choose the Contact lookup button and select an existing contact for the case or choose New in the inline lookup results to create a new contact record. a. From the Identify area of the process bar, choose the Find Case lookup button and then select a case from the list of cases. b. If a case doesn’t exist, choose New in the inline lookup results to create a new case record. In the Case title field, type a subject or descriptive name to identify the case. To see what kind of support you should provide the customer, choose the Entitlements lookup button and select an active entitlement. If you’re on CRM Online 2015 Update 1, and your manager has set default entitlements for a customer in CRM, then when a case is created or when a case is updated and the customer, contact, or product field has changed then a default entitlement is automatically associated with the case. When a case is created and an entitlement is applied to it (or when the case gets resolved), the entitlement terms from the associated entitlement are decremented. However, if you don’t want the entitlement terms to be decremented for a case, from the command bar choose Do not decrement entitlement terms. 9. Fill in the other details that apply to the case, and then choose Save. You can look at resolved cases to see if they can help you resolve the open case you’re working on. For example, if the subject of the case you’re working on is “Service outage,” you could look for resolved cases with the same subject to get help with your current case. In the list of active cases, open the case you’re looking for. When the case is open, to find similar cases, choose Case Relationships to expand the menu. For Similar Cases, choose (+) Add Connection record. From the Find Similar Cases dialog box, use the search to find similar cases. Select a different subject to see the cases with that subject. You can also search for cases by typing the keyword in the search box, and then choose the Search button. When you use a search keyword, it searches on the title of the case and shows the matching results. When you find a similar case, choose the case to review the case activities, posts, and notes. Typically, a phone call, task, or case resolution activity has the information about how the case was resolved. Once you find the case that has the information you need, choose the case, and then choose Found a Solution. The case you select is added to the Similar Cases area for the case you’re working on. For information about how to resolve parent and child cases, see “Resolve a case with a parent and child relationship” section in Create and manage parent and child cases. In the list of active cases, open the one you want to resolve. On the command bar, choose Resolve case. Before you resolve a case, make sure that all the case activities are closed. Otherwise, you’ll get a message saying that you still have open activities associated with the case, which will be canceled if the case is resolved. In the Resolve Case dialog box, in the Resolution Type list, select how the case was resolved. In the Resolution box, type a short explanation of the resolution. The actual time spent on all activities for this case, as recorded in the Duration box in each activity, is filled out automatically in the Total Time box. In the Billable Time list, select the amount of time spent on the case to be billed to the customer. If this case is linked to a contract or entitlement, the billable time will be subtracted from the allotted minutes for that contract. A case resolution activity is created and shown in the Activities area. The resolution activity contains information about a resolved case, including the resolution and total time spent on the case. You can reactivate a resolved case at any time. From the list of cases, open the case you want to edit. When the case is open, make the necessary updates to the case. When you’re done, choose Save. All case activities must to be closed before you can cancel a case. In the list of active cases, open the case that you want to cancel, and then on the command bar, choose Cancel Case. Canceled: This means the case is canceled and it will no longer be assigned to you. Merged: This means the case is merged into another case. When the case is merged, the case activities will be moved to the case it was merged into. If you don’t have enough information to resolve a case, or if you think another member in your team has expertise on the subject, you can assign the case to another user or team. Select the case that you want to reassign. If using the web app: On the command bar, choose More Commands and select Assign. b. If using CRM for Outlook: In the Collaborate group, choose Assign. Choose the Lookup button , and select who you want to assign the case to. If you think another group in your team has the expertise on the subject, you can move the case to a queue so that someone else can pick it up. Select the case that you want to add to a queue. a. If using the web app: Choose the More Commands icon , and select Add to Queue. b. If using CRM for Outlook: In the Collaborate group, choose Add to Queue. Choose the Lookup button , select the queue that you want to add the case to, and then choose Add.